Easy, 4 ingredient oil-free rosemary french fries that are super healthy and delicious. 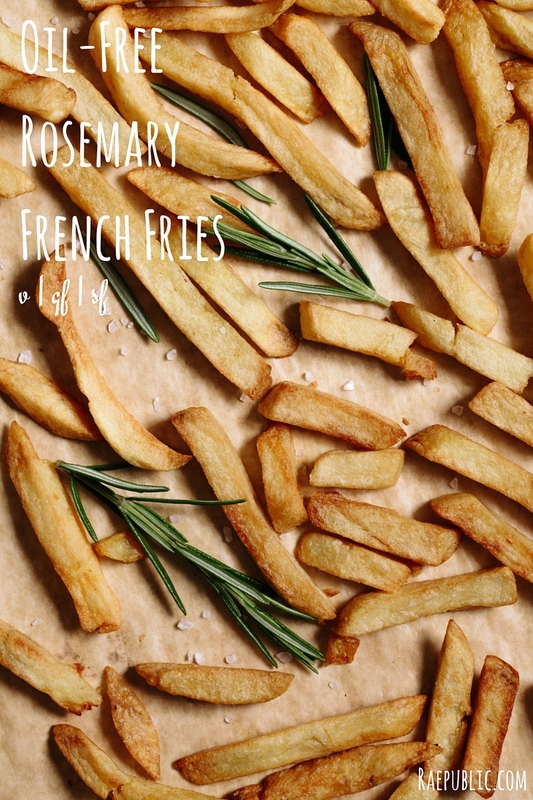 These naturally vegan rosemary french fries are gluten-free and sugar-free so all can enjoy! Did you know that russet potatoes are an excellent source of vitamin B-6 and potassium? Throw uncooked french fries into a large bowl. In a mortar and pestle combine rosemary, garlic powder and salt and grind into a fine powder. Sprinkle mixture over fries and stir thoroughly until evenly coated. Spread french fries on a cookie tray lined with a silicone baking mat and bake for 15 minutes. If you love this plant-based snack make sure to try out these vegan Sweet Potato French Fries. Make sure to follow me on your favorite social media platforms and comment below if you're lovin' this oil-free french fry recipe!